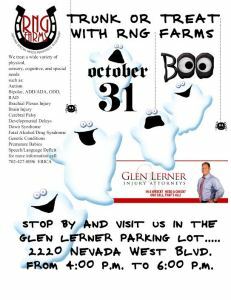 No tricks, just treats when Glen Lerner Injury Attorneys partners with RNG Farms to host a safe Halloween Trunk or Treat event in the parking lot outside their Pahrump law office at 2220 Nevada West Boulevard on October 31 from 4:00 p.m. to 6:00 p.m. Candy will be passed out from the trunks of local Model A club cars and those of other local business owners and community members. It’s going to be howlishly good time! The event is free to the public. Children of all ages are invited to stop by, get some candy and show off their spooktacular costumes. RNG Farms is a local-owned facility that has subcontracted with Dream Therapies in Las Vegas to bring licensed Occupational Therapy, Speech Therapy, Feeding Therapy, Hippotherapy to special needs children in Pahrump, Nevada. They offer therapeutic riding to children with a certified C.H.A IRD instructor. They also have a certified Equine Massage practitioner who makes house calls. For more information about the facility, please visit facebook.com/RNGFarms, e-mail [email protected], or call (702) 427-8096. 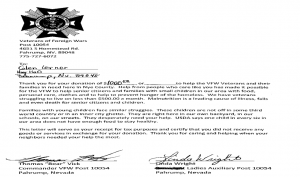 Glen Lerner Injury Attorneys received the following thank You from Pahrump VFW Post 10054 for a recent donation. The $1,000 donation will be used to assist Veterans and families in need purchase food, clothing, and personal care objects. If you would also like to help make a difference in the life of a local Veteran and/or family in needs, please contact the Pahrump Veterans of Foreign Wars by calling (775) 727-6072. As the air starts to chill the Pahrump Disability Outreach Program (PDOP) heats up their annual fundraising efforts with the annual Pumpkin Days and 5k Monster Dash. Last year’s event brought in over $25,000 that the organization used to support and educate local children with disabilities and their families. 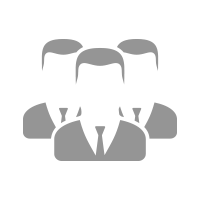 This year, our Pahrump personal injury law firm staff members will be volunteering for the whole weekend, and will donate items for the 5k Monster Dash runner/walker bags and $100 gift card to be given out as a prize to one lucky 5k Monster Dash winner. The 2014 PDOP 5K Monster Dash will be held on Saturday, October 25 at Ian Deutch Memorial Park (1600 Honeysuckle Street, Pahrump, NV 89048) at 8:00 AM.Participants are invited to dress up in costumes to dash about in ghoulish fun for a good cause! Monster 5k Dash registration fees include free entry into PDOP Pumpkin Days event. 2014 Pahrump Disabilities Outreach Program Pumpkin Days will be held October 24 – 26. Friday, October 24th from 3:00 p.m. to 9:00 p.m.
Saturday, October 25th from 9:00 a.m. to 9:00 p.m.
Sunday, October 26 from 9:00 a.m. to 7:00 p.m. Single day entry is just $5 or $10 for the entire weekend. Color-coded wristbands will be sold at the gate for day or weekend passes. Family fun and food includes: face painting, petting zoo, hay maze, haunted house, train rides, pony rides, a pumpkin patch, kettle corn, hot cider, pulled pork, pumpkin pie, and more. 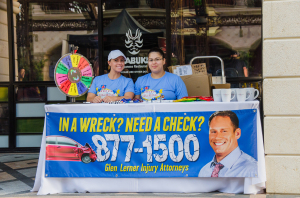 Glen Lerner Injury Attorneys was an event sponsor for the Rocky Mountain Rodeo that was held in conjunction with the Pahrump Fall Festival held September 26th – 27th, at McCullough Arena located at 250 N Highway 160, Pahrump, NV. As our personal injury law firm is a strong supporter of local community groups and events, one of our senior case managers, Lynne Johnston, served as a parade official for the annual Pahrump Fall Festival. In addition to being a Rocky Mountain Rodeo sponsor, we also sponsored tickets for a VIP rodeo experience for adults with disabilities and children with RNG Farms, a theraputic center that assists children with special needs.A highlight of the experience for the kids and their family members was the opportunity to be taken down to the arena to practice roping, meet some of the cowboys and rodeo clowns prior to the Friday night rodeo. RNG Farms is a subcontracter of Dream Therapies,which is based out of Las Vegas. Their therapeutic facility has licensed Occupational Therapy, Speech Therapy, Feeding Therapy, Hippotherapy who work closely with special needs children in Pahrump, Nevada.They offer therapeutic riding to children with a certified C.H.A IRD instructor. They also have a certified Equine Massage practitioner who makes house calls.  Watch the following video to learn more about RNG Farms. Glen Lerner Injury Attorneys was a proud sponsor of the 4th annual UnitedHealthcare Children’s Foundation 2014 Teddy Bear Run (5K) and 1 Mile Walk on Saturday, September 27 at Tivoli Village in Las Vegas. Proceeds raised from the 2014 Teddy Bear Run will support the UnitedHealthcare Children’s Foundation and their efforts to provide financial assistance to children with medical needs who would otherwise go without.  The UnitedHealthcare Children’s Foundation (UHCCF) is a 501(c) (3) nonprofit charity that offers medical grants to families who have financial hardships so that their children’s medical needs are covered. UHCCF has awarded more than 7,500 grants valued at over $23M to children and their families across the United States since 2007. UHCCF’s receives the majority of it’s funding through contributions from individuals, corporations and UnitedHealth Group employees and through events such as the 2014 Teddy Bear Run. You can learn more about their grant program and how to apply at www.uhccf.org.